I have a confession to make. There was a time when I didn't really like brunch food. When I'd go out to brunch with friends, I'd be the person ordering a turkey sandwich when everyone else was enjoying pancakes or omelettes. Happily though, I started to appreciate the merits of brunch food when I was in college. And now, nothing makes me happier than Eggs Benedict, or bagels with lox, or of course, pancakes. I'm super excited to share this recipe with you. I don't have many breakfast/brunch recipes on the blog, but starting with this recipe, I'm going to change that. 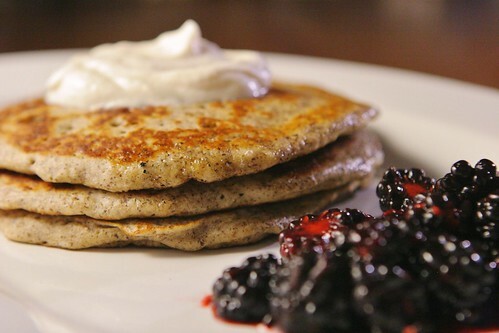 These pancakes are adapted from Heidi Swanson's wild rice pancakes in Super Natural Cooking - I always use buckwheat flour instead of wild rice flour, and I love how the pancakes taste. They have a more complex flavor than traditional white flour pancakes, and pair really well with the macerated blackberries and Earl Grey whipped cream. The idea of infusing whipped cream with tea was inspired by a recent issue of Bon Appetit, and I decided to use Earl Grey because I really enjoy the flavor of bergamot. When I told Andrew about the Earl Grey idea, he suggested that blackberries would be a good pairing, and he was absolutely right. The three components of this dish blend together beautifully to make an elegant dish that would be a great choice for a Mother's Day brunch. Make blackberries: Mix blackberries, lemon zest, sugar, and lemon juice together in a medium bowl and lightly mash berries with a fork. Cover bowl and refrigerate for at least 2 hours. Make whipped cream: Heat cream over medium heat until cream is steaming and beginning to foam. Remove cream from heat, add tea bags, and steep for 20 minutes. Remove tea bags, transfer cream to a bowl, cover, and refrigerate for at least 2 hours. Using an electric mixer, beat cream until soft peaks form. Add confectioner’s sugar and continue to beat until stiff peaks form. Refrigerate whipped cream until pancakes are ready to serve. Make pancakes: In a large bowl, whisk together flours, baking powder, baking soda, sugar, and salt until well mixed. Add buttermilk and eggs and whisk until just combined (batter will be a bit lumpy). Melt a small pat of butter on a skillet or griddle over medium heat. Pout ⅓ cup of batter on the griddle and cook until the bottom of the pancake is deep golden. Flip pancake and cook until other side is golden and pancake is cooked through. Repeat with remaining batter. Serve pancakes with blackberries and whipped cream. Leftover berries, whipped cream, and cooked pancakes can be stored in the fridge for a couple days. Reheat pancakes for about 30 seconds in the microwave before serving. I love using buckwheat. Such a great flavor. I love pancakes and these look great! The Earl Grey whipped cream is such a great idea, especially for breakfast. These are seriously beautiful, and I love the idea of earl grey whipped cream. This would make a perfect mother's day brunch! We are not used in having brunch in Greece but I will be more than happy to have these tasty looking pancakes for breakfast! oh beautiful, this looks like the perfect brunch! I looovvee the really distinct flavor of buckwheat pancakes! So much more appealing than plain old white flour ones for sure! The tea infusion for the whipped cream is such a great idea! I love the sound of the Earl Grey cream! Sounds incredible alongside fresh berries! Can you really taste the tea in the whipped cream? I have been meaning to make "chai" cupcakes for a while and that would be the perfect topping! Yup - you can definitely taste the tea!